Magnificent views open around the lake from the Molinera and the panorama of mountains of the Sierra de Cadiz. 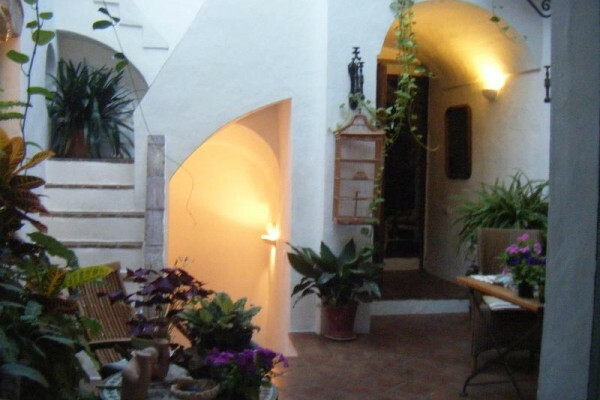 Hung from the rock in the middle of the old walled town, the courtyards of the house with Mediterranean light, the room with vaulted ceilings, terracotta floors, old gates, balconies full of flowers ... 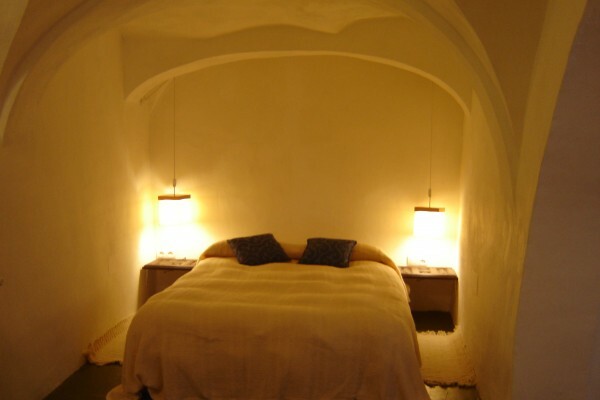 The typical Andalusian style, which distinguishes the rustic setting of LA CASA DE BOVEDAS giving a special magic. The doors of this house, which was recently renovated, are open to all visitors, for a holiday romance and discover the secrets of the rest of the White Villages and above all, feeling that one comes home, to enjoy the atmosphere a cozy hotel with charm. Two suites and four double rooms are grouped around the central courtyard with a glazed roof. In addition, the open courtyard, terrace with great views and lounge with a fireplace. All rooms are spacious and bright and have central heating, air conditioning, television, audio, CD player and hair dryer in the bathroom independently (with bath in the suites). Each room is decorated differently from the other, where numerous details deserve the proper rest and the pleasant comfort of every visitor to ensure the inimitable atmosphere of an old house but enjoy modern comforts. - The entire building has Wi-Fi to connect to the Internet. 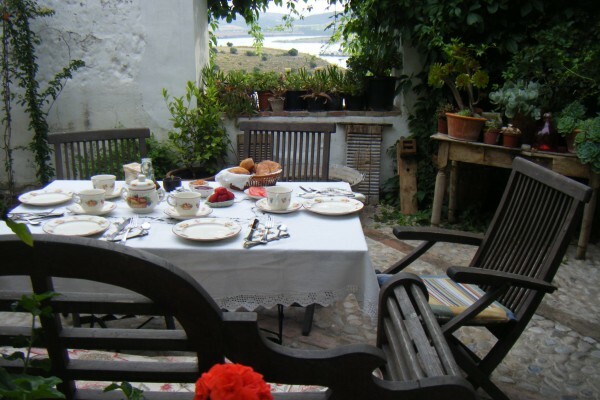 Enjoy the wonderful breakfast in the open courtyard beneath our venerable lemon tree, or just relax watching the flight of birds in the valley is to reach his hand. Walk down the village in its narrow streets, where you can also see many small restaurants and tapas bars to enjoy. Once it has reached Arcos, you should use the streets of Bethlehem Cuesta Corredera and go until you are in the historic center. We recommend to park his vehicle in the Plaza del Cabildo in front of the main church of Santa Maria. 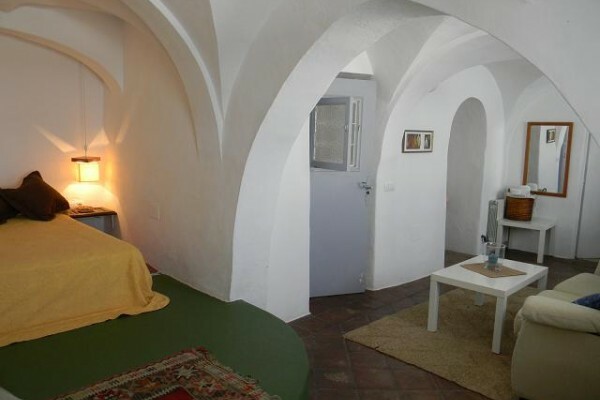 THE HOUSE is located about 200 meters from the square and is easy to go on foot. If you need help with luggage, please call us by phone that we are ready to help. Due to its geographical location, almost in the center of the southernmost province of mainland Spain, Cadiz, Arcos has a good connection with the rest of the regions of Andalusia. Good roads to motorways the most important destinations within reach: the white sand beaches of the Costa de la Luz and the Bay of Cadiz (both less than an hour away), Jerez de la Frontera, a city of horses wine and sherry (about 20 minutes), Seville, the Andalusian capital (a little over an hour). Jerez de la Frontera is a possibility, local trains (for example, after Cadiz and Seville) or long distance (direct connections to Madrid and Barcelona) for their use. As to the maritime links, the port cities of Cadiz and Algeciras, the two main focal points. No experiences yet with La Casa De Bovedas Charming Inn. Be the first! Did you stay in La Casa De Bovedas Charming Inn? Let us know what you thought about it and help others to make the right choice! * I confirm having stayed in La Casa De Bovedas Charming Inn.